Up until late November, Rostov had spent the whole season in the top five positions of the RPL – enough to qualify for European football in 2019/20. Despite a disappointing 1-0 loss to Krylia Sovetov dropping the Selmashi down to their lowest position of the season (7th), their success has been both refreshing and highly commendable. Success is no stranger to the small team from the south. Under Kurban Berdyev, the Selmashi rose to the glittering heights of second, one Igor Akinfeev save away from a league title and even defeated Bayern Munich in the UCL as a result in the following season. However, crucially, the club is now experiencing it’s current successes not just as a direct result of the brilliant management of one individual, but a true collective group effort with a backbone of simply running a club effectively. Although the fairy tale of 2015-17 was an incredible sight, their success was generally unsustainable if Berdyev decided to leave, and he did, taking half of the playing squad with him. As a result, the club started last season having lost 13 players (most first teamers), facing a transfer ban and went almost three months without paying a single player. Luckily, financial investment came in the form of regional government funds, a shirt sponsor for the first time in two years, and increased RPL financial rewards. 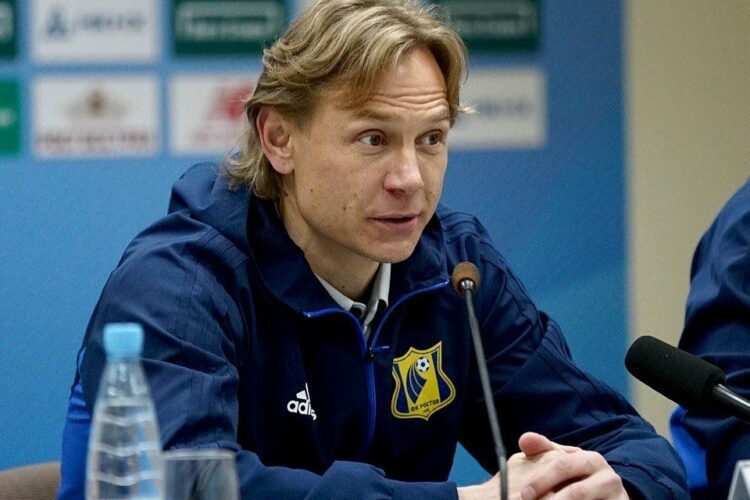 Rostov struggled for form, and the managerial appointment of Valery Karpin seemed on the surface uninspiring at best. However, he has rebuilt and galvanised a squad with just the right blend of experience and youthful exuberance and led them to overachieve incredibly. The focal point, however, has been the incredible recruitment since Berydev’s tenure and the European adventure almost bankrupt the club. In order to rebuild, the club’s directors re-focused, and instead of buying young, foreign stars and Russian’s in the twilight of their career, switched tact. They scout European leagues heavily, and at the time of speaking have employed more scouts in Scandinavia as a whole than any other side in the league. The aim is to find gems from afar, develop within and sweep up young, homegrown talents ignored by the elite clubs. The bedrock of this wise rebuild has been the staunch defence, currently at its strongest since the golden days of Berdyev. Icelandic duo Sverrir Ingi Ingason, Ragnar Sigurdsson and Polish international Maciej Wilusz start in a defensive three, and were bought for a combined €1.8m, less than a quarter of what the talented but erratically inconsistent Miha Mevlja was sold to Zenit for. Only Zenit have defeated Rostov by more than a one-goal margin all season, with the measly defence conceding just 11 goals in 17 games. Two of these defenders are Icelandic, but the link does not stop there. Vidar Orn Kjartansson and Bjorn Sigurdarson were also signed in the last two seasons by Karpin himself and act as the tip of Rostov’s spear (or rather, battering ram). Despite being able to mix it up at times, the side play to their strengths – a classic 3-5-2 formation with attacking wing-backs and large target men to hit direct balls or crosses too. This Icelandic link makes sense for Rostov aside from fiscal responsibility. The two cost just €3.5m and have plundered nine goals in all competitions this season. However, any player who is involved in the Icelandic setup knows innately how to perform in a counter-attacking set up based upon achieving a solid defence first. The pair also act as a perfect foil to top scorer Aleksei Ionov, allowing the veritable veteran to find space in behind to finish chances created by his bean-pole striking partner. The converted-striker is joint top goalscorer with four goals. Swedish duo Anton Saletros and Denis Hadzikadunic are two more Scandinavian players to have joined, but have yet to impress much (nor have they been given a sustained chance, to be fair). The star man, however, have been a young Russian international almost cast adrift by his former side at one point; Ayaz Guliev. The diminutive (in height but not physique) central midfielder was signed permanently in the summer for a paltry €500,000 from Spartak Moscow. Acting as the deep-lying playmaker, he is adept at breaking up opposition play before cutting the opposition apart with his incisive passing, especially at length. Guliev has an impressive 80% pass success rate with an equally-impressive 60% success for balls over 25 yards. However, he also completes, on average, 5.1 interceptions, 3.4 tackles and 6.1 dribbles per game, proving his innate ability to act as a real all-round central midfielder. Although club captain Alexandru Gatcan has been a bulwark at Rostov, Guliev has kept the ageing Moldovan out the side this season. Such has been his meteoric influence, Guliev has now returned to Spartak Moscow – courtesy of a €1m release-clause. Dmitri Skopintsev, Ingason and Wilusz have all likewise been linked with moves away. Artur Yusupov has already moved on, but if any more key players are to leave, it will be up to Rostov’s impressive scouting department to replace them ably to keep up their current form. 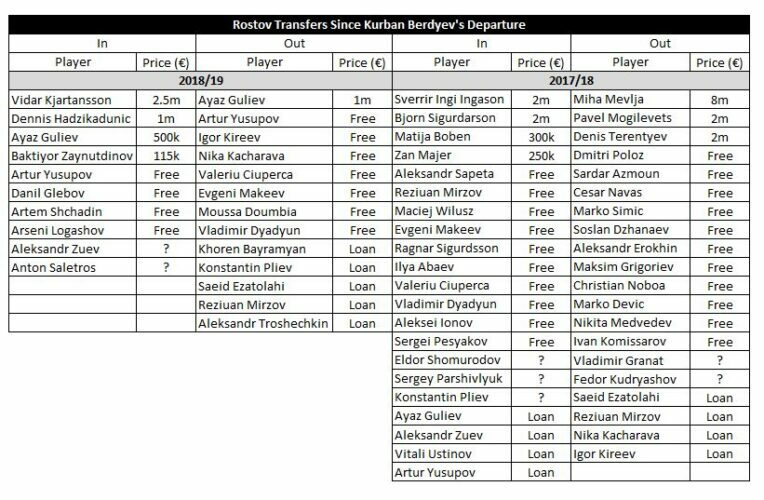 While not all transfers since Berdyev’s departure have been a success, there are a few key differences. Rostov’s current squad average age is the youngest that is has been at any stage of the last five years, and crucially, the last two seasons have been the first time the side have received transfer funds at all from selling players in successive seasons this decade. Last season was also the first time Rostov have received a fee at all for any player since Bastos left for Lazio in 2015. This newly-found profit has allowed Rostov to once again pay for players, receiving €14m in two years, while the newly found sponsors and Rostov Arena ticket sales allow the club to be self-sustainable for the first time.